^ Protter & Morrey, Jr. 1970, p. 520. ^ Protter & Morrey, Jr. 1970, p. 526. ^ Protter & Morrey, Jr. 1970, pp. 526–528. ^ Larson 1998, pp. 458–460. ^ Altshiller-Court 1925, p. 101. ^ Kay 1969, pp. 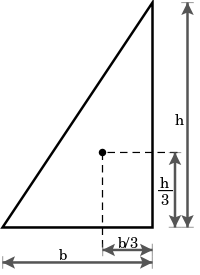 18,189,225–226. ^ a b Altshiller-Court 1925, pp. 70–71. ^ Bourke & July 1997. Weisstein, Eric W. "Geometric Centroid". MathWorld（英語）. Encyclopedia of Triangle Centers by Clark Kimberling. 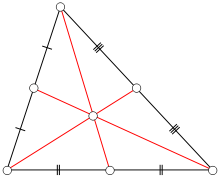 The centroid is indexed as X(2). 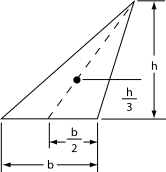 Experimentally finding the medians and centroid of a triangle at Dynamic Geometry Sketches, an interactive dynamic geometry sketch using the gravity simulator of Cinderella.